The Star City School District is now accepting applications for students wishing to participate in the School Choice Program. Open Enrollment begins February 1 and runs until May 1. The School Choice Act 560 of 2015 is the program authorized by the Arkansas General Assembly that allows parents to apply for their child's admission to participating school districts other than the one in which they reside. 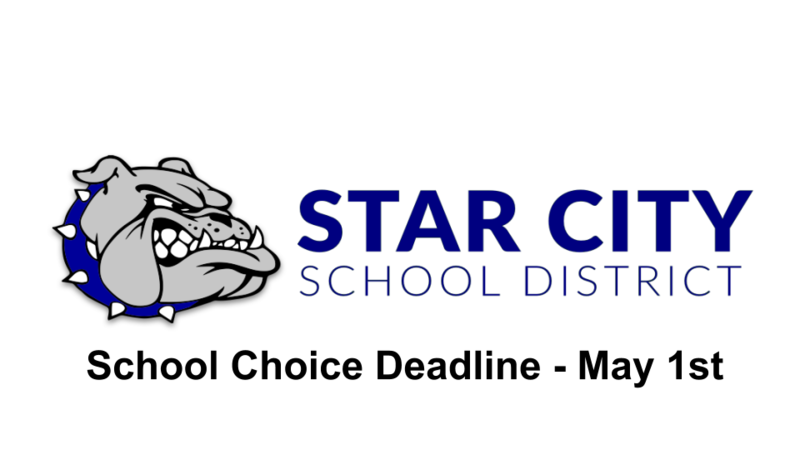 The Star City School District has agreed to accept eligible students from other school districts under the School Choice Program during the 2019-2020 school year. Application forms are available at the Star City Administration Office, 400 East Arkansas, Star City, AR or online at Star City School Choice Application. Applications for the 2019-20 school year must be received on or before May 1, 2019, to be considered eligible for the coming school year. Applications should be turned in to the non-resident district which shall notify the resident district of the filing of the application. Assignments will be made on the basis of space availability. Applicants will be notified of their acceptance or rejection by July 1st. Students who reside out of state or who are currently expelled from school for a drug or weapon violation are not eligible for participation. Please contact Star City Schools at 870-628-4237 if you have any questions.